Senior defensive lineman Will Campbell says he has slimmed down to 315 pounds and is determined to have a standout season for the Wolverines. For most of last season, the consensus on Will Campbell's struggles centered around leverage. Or, more specifically, lack thereof. Whether it was Michigan football coach Brady Hoke, fellow defensive tackle Mike Martin or senior defensive end Ryan Van Bergen, the answer to why the 6-foot-5-inch Campbell struggled to find consistency was his struggle to stay low at the line of scrimmage. Campbell heard all the excuses made for him a year ago and every year before that. But this spring, he's done listening to them. Now a senior and down to his last college football breath, he's done making them, too. "It probably wasn't me being tall," Campbell said with regard to his past leverage issues. "It was probably me being lazy." First comes acceptance, and then comes progress. Campbell always has been, and likely always will be, larger than life. He came to Michigan out of Detroit Cass Tech High School in 2009 every bit of 6-5, weighing what he admits now to be about 356 pounds. He had five recruiting stars in front of his name, an offer sheet that might make Marcus Dupree blush and expectations that were even larger than his massive frame. Even now, when he enters a room, people notice. A year ago, an underachieving Campbell rarely was made available to the media. But on Tuesday, when Michigan brought the senior defensive tackle out of the locker room for interviews, a horde of reporters immediately noticed, surrounded and fired away. There were questions about his attitude, his weight (he's down to 315, by the way), his previously unfulfilled expectations, why he previously switched positions (twice) and how he intends on making up for three rather quiet years with one final hurrah. But with every individualistic inquiry fired at Michigan's mountain of a defensive lineman, a team-oriented response seemed to quickly follow. "You're not playing for yourself. 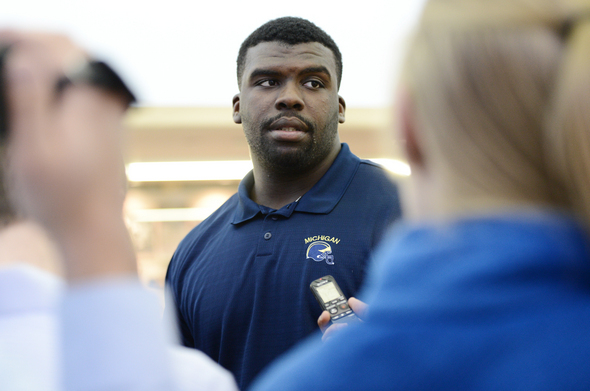 You're playing for your teammates, for Michigan, the block 'M', " defensive lineman Will Campbell said. "You're not playing for yourself," Campbell says. "You're playing for your teammates, for Michigan, the block 'M.'" Earlier this spring, Hoke turned heads when he mentioned Campbell's name among a group of emerging leaders on the defensive side of the ball. Asked about Campbell later in the day, junior safety Jordan Kovacs echoed Hoke's sentiment, explaining how Campbell has been going out of his way to arrange position group meetings. Michigan defensive coordinator Greg Mattison has admitted Campbell isn't yet where he needs to be, but the former NFL defensive line coach did acknowledge that Campbell is a senior. And at Michigan, when you're a senior, things change. "When you become a senior, you're kind of expected to step up," Michigan senior defensive end Craig Roh said. "Will is always the first one (to go through a drill). "If you're the last guy, no one's going to listen to you." His defensive mates aren't the only ones noticing the change in his game and motor, though. The players opposite him, the guys who have to block him every day, also have seen a difference. 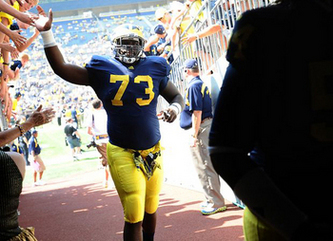 "Will Campbell is definitely a talent," Michigan center Ricky Barnum said. "I really don't get to face that many nose guards in the Big Ten that big. "But Will pushes me every day to get better." Campbell said part of the inspiration for his attitude shift came from a conversation with former Michigan defensive lineman Rob Renes, a member of the 1997 national title squad. Renes, who was coached by Hoke during his time at Michigan, explained what the expectation of a defensive lineman is under Hoke's coaching regime. He has followed the example of former hard-working defensive lineman Will Heininger and attempted to model himself after former teammate Brandon Graham, who also battled with weight issues before turning into an NFL player. He says he has had his sitdowns with Hoke and Mattison, and has allowed both to tear down his game with hopes of building it back up again. Perhaps most importantly, Campbell says he has ignored most outside criticism of his underwhelming career to this point and all the expectations set for him as a prep player. He doesn't much care how he has measured up in the eyes of everyone else. Mainly because, in his own eyes, he has fallen short thus far. "Everyone has expectations for themselves," he said. "And no, I don't think I've met my own expectations." By all indications, Campbell's senior year has started off on the right foot. A positive season in 2012 might not wash away the three previous years of Campbell's Michigan career, but it would certainly help. He's leaner, he's focused, he has admitted his faults and he's ready to work. "I just like wearing the winged helmet," Campbell says. "I just like being a Michigan Wolverine." He has almost nine more months to prove how much. Fri, Mar 30, 2012 : 4:49 p.m. I hear this every year about this guy. &quot;Things are different now. He's really taken on the role of leadership. blah, blah.&quot; Nothing will change. It'll be great to see him finally graduate because he is taking up a scholorship and really is a bad influence to the rest of the team with his indifferent attitude. Fri, Mar 30, 2012 : 3:26 a.m.
Will WILL have a great season. He's a Michigan Man, for gosh sake! Thu, Mar 29, 2012 : 11:20 p.m.
What will tomorrow's &quot;Big Will needs to step up&quot; column/article look like? Seriously the media should lay off of Will. They keep asking him the same questions over and over. It is as if the media wants him to be a bust...so that they can have something to write about. Thu, Mar 29, 2012 : 7:04 p.m.
No doubt about it Will, you will have a breakout year and you know why I know that Will? Thu, Mar 29, 2012 : 6:25 p.m.
Go for it Will! You an be great! Thu, Mar 29, 2012 : 3:26 p.m.
One year to give back all that the big M and your team mates and coaches have gives to you! Thu, Mar 29, 2012 : 2:36 p.m.
Thu, Mar 29, 2012 : 2:09 p.m. Better late than never. I hope that Will Campbell will achieve his personal goals. Let's hope that the best is yet to come. Thu, Mar 29, 2012 : 1:31 p.m.
running out of TIME on this guy !!! Thu, Mar 29, 2012 : 12:15 p.m. Step it up! We need you this year big guy.